If your cup of tea is composed of a vibrant nightlife mixed with eclectic dining and activity alternatives, then head on to The Fort! This enclave of shops, stores, restaurants, bars and activity centers inside Fort Bonifacio can enthrall even the most discriminating patrons. Start your nightlife with cocktails and some light appetizers over at Red Kimono, this hip red-inspired Japanese fusion restaurant that serves excellent sushi which you enjoy whilst you sit on brilliant red colored furniture. For a heavy dinner, load up on a middle eastern lamb delicacy at Hossein’s, one of the top restaurants in it’s class. Hossein’s has developed a significant following among the Makati white collar connoisseurs due to its authentic and very flavourful cooking. Prince of Jaipur is another excellent choice, as it carries the ethnic flavour a notch higher with belly dancers to complete the dining experience. Should you yearn for something more Asian, there are restaurants that offer superb Filipino cuisine, as well as Chinese fare. Try out the sinigang na bangus at chicharon, or the Filos baked laing. Both are excellent meal choices before bingeing on booze and wine afterwards. And according to their menu, the sinigang is actually good for three people! If you head on just a bit further, Palm Beach offers Chinese cuisine. Superb? Well, Chinese food is Chinese food. It is always delicious, always well cooked, and consistently well appreciated by Filipinos. After all that food, you might want to chug down a couple of cold beers; and if the windy open space is something you enjoy, then head on to Pier One. The outdoor ambiance of this restaurant will surely lead to a more relaxed atmosphere for everyone in this informal setting. Watch the moon go through its phases, or just gaze at the other table to see stars. If you care for an evening fashion show, or a concert or even a rave event, head on down to the NBC tent, which often holds special events such as those. Do check in advance though, as they are either invitational, or ticketed; and tickets go quite fast. After dinner coffee is also getting to be more and more popular and The Fort has its share of venues for you to drink this beverage. Illy, among the best coffee brands available, is a popular choice. Lavazza is another popular brand. Find them in restaurants at The Fort. Or if you prefer the coffee bar experience, Gloria Jeans is right across the center activity area. And what if you get hungry again? Don’t worry. 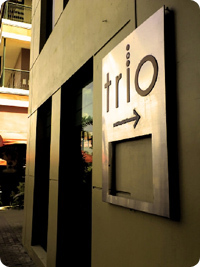 Go grab a pizza at Trio. Or get a late night tapas plate at Minggoys. So long as the lights are on, food, wine, and good times are something you won’t run out of at The Fort.